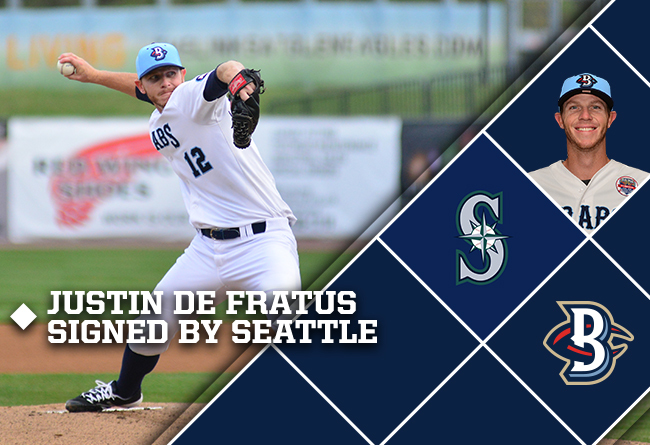 (Waldorf, Md., May 9, 2017) – The Southern Maryland Blue Crabs announced on Tuesday that the contract of Right-Handed Pitcher Justin De Fratus has been purchased by the Seattle Mariners’ organization. De Fratus will report to the Arkansas Travelers, AA affiliate of the Mariners. To this point in the 2017 season, De Fratus leads the Blue Crabs starting rotation with a 3-1 record, and 1.40 ERA. He was named the opening day starter for Southern Maryland in his first season with the team. He leaves the team leading the Atlantic League in innings pitched (25.2), tied for first in wins (3), second in strikeouts (22), and third in ERA (1.40) among eligible pitchers. Prior to signing with the Blue Crabs, De Fratus played nine seasons in the Philadelphia Phillies organization, as well as spending 2016 between the Washington Nationals, Seattle Mariners, and Texas Rangers organizations. He has spent five seasons in the MLB, all as a reliever with the Phillies, from 2011-2015. He has appeared in 191 MLB games, posting a 7-6 record with a 4.09 ERA, while striking out 170 batters in 194 innings pitched. De Fratus is the first Southern Maryland Blue Crab to have his contract purchased by a MLB organization in the 2017 season. The Blue Crabs play 140 regular season games in the Atlantic League of Professional Baseball Clubs. The Blue Crabs play at Regency Furniture Stadium in Waldorf, Maryland with affordable family fun. The franchise will open its 10th anniversary season on Thursday April 20, 2017. Please call 301-638-9788 or visit http://www.somdbluecrabs.com for more information and to reserve your seat at the ballpark today!